Even before Donald Trump was elected president, I wondered what symbolic act would be justified should the infamy occur. 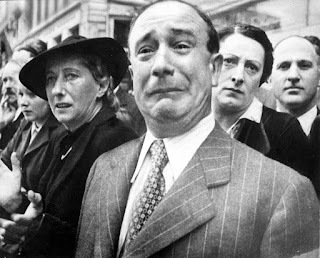 I remembered an old photo from Life magazine, showing a weeping Frenchman in Marseilles in 1940, watching as the flags of France were evacuated to North Africa after the Nazi onslaught. Maybe it was time to put away my American flag, I thought. Store it in plastic until the occupation ends four years from now. Why let it fly over a country that has brought itself so low, delivered such an intentional blow to the freedoms we cherish? But that seemed defeated, timid. Better to let the banner fly over the country in good times and bad. I think that was the right decision. Though yesterday morning, I noticed it very tightly wrapped -- the wind. That happens. I usually go twist the flagpole so it hangs free and full. Typically, I do that several times a day. Not this time. Somehow, the tightly-wrapped flag feels right for this tightly-wound national moment. The election is one of those ringing disasters that drops from consciousness for a minute or an hour then comes back with the morning headlines or the phone call from a friend. And we are wound up in it again. Times are tight, in the sense of narrow, bound, difficult. This is something that is going to have to unwind itself—with all of our help, of course, in due course, and we are going to have to be vigilant if the rights of our fellow citizens are plucked away. But if you believe that Trump is a liar and a fraud — and I do — then that cuts both ways, and given that much of what he advocates is either unconstitutional, impossible or both, it makes sense that he will back away from the worst of what he was elected promising. He has already begun doing it, without much prompting from without. November is not half over. With December and most of January to come before he becomes president, with four long years after that. This is a marathon, not a sprint, and we need to adjust ourselves accordingly. I can't go running to fix the flag every time some chance breeze sets it all awry. That's not my job, not any one person's job. Sometimes you have to be a little patient let things unfold and work themselves out. I'm not advocating indifference, but forbearance. Head up, shoulders back, gazing steadily at events as they unfold. Leave weeping to the French. You can't leap every time the wind blows. We will know when time for action will come, and it'll come soon enough. Now the thing is done, and we have to see what unfolds. Ever the optimist, I'm hoping that Trump's abrupt change of tone is signifies a seriousness that was sorely lacking the last year and a half. I'm assuming that he will gather realistic people to advise him and am willing to give him a chance to show the world that he's worthy of the job. However, I note that his most avid supporters are still angry and resentful. Not a good omen.